A revolutionary Anti-Aging hair serum formulated with cutting edge technology to delay the graying process. 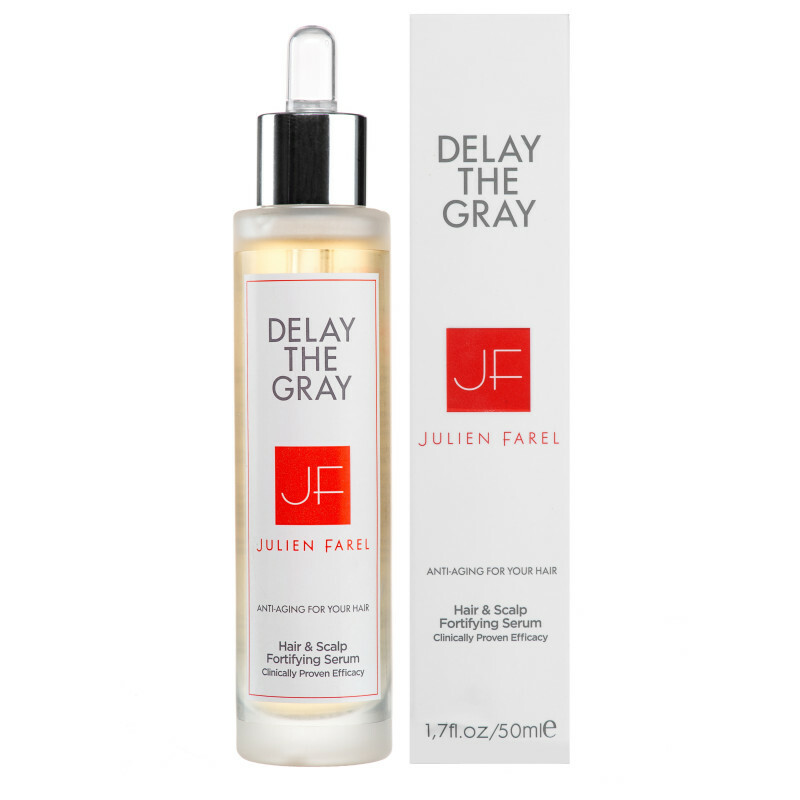 Powered by the Julien Farel Hexapeptide, Magnifique Delay The Gray Hair & Scalp Serum stimulates and enhances the pigmentation process by boosting melanin levels to slow the graying of hair and improves hair's youthful texture and appearance. This quick absorbing, water-based serum acts as a youth elixir to energize thinning hair and sustain healthy hair renewal. It also nourishes follicles and improves hair texture with intense hydration. • Echinacea + Edelweiss Stem Cell Extracts energize and sustain healthy hair renewal • Hyaluronic Acid hydrates deeply in to the layers of the scalp and hair • Ideal for hair thinning or hair weakened by stress, over-processing, environmental damage or seasonal change. • SLS, Paraben, Silicone and Cruelty Free. Not tested on animals. Color Safe. Dermatologist Recommended. Julien Farel Vitamin Restore is a first-of-its-kind hair & scalp treatment that brings an instant moisturizing effect and long term health to hair & scalp. Vitamin Restore creates unmistakably stronger, healthier, shinier hair after just one use by treating and stimulating the scalp. Colored and chemically treated hair feels dry due to damage during the chemical process and Vitamin Restore works to replace lost vitamins with a potent fusion of anti-oxidants, bioactives and Hyaluronic Acid. • Vitamin Restore is multi-functional: shampoos + conditions + treats in one step • Hyaluronic Acid adds lightweight yet advanced hydration for softness and manageability, great for creating volume for thin hair • Vitamin Restore is a gentle cleanser: shampoo first if hair has heavy buildup and use Vitamin Restore to rebalance pH level in scalp • Visibly changes your hair after one use: 90% said their hair was shinier while 88% said their hair looked healthier • SLS, Paraben & Cruelty Free. Dermatologist Recommended. A luxuriously rich, color safe shampoo that gently cleanses without stripping color and natural oils. Extend your hair color with this thick, nourishing shampoo that features A2B (Anti-Aging Balance) Technology to preserve color, brighten hues and protect against color fade. 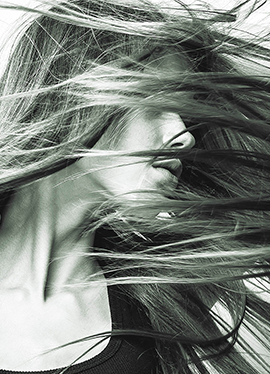 Hair is unmistakably stronger, healthier and shinier. • Ideal for hair weakened by stress, over-processing, environmental damage or seasonal change. • Key Anti-Aging ingredients such as Hyaluronic Acid and Panthenol add lightweight moisture for softness and manageability • Vitamins B,C,E nourish and strengthen to prevent overdrying, make hair more resilient against breakage and environmental damage • SLS and Paraben Free. Color Safe. Dermatologist Recommended. 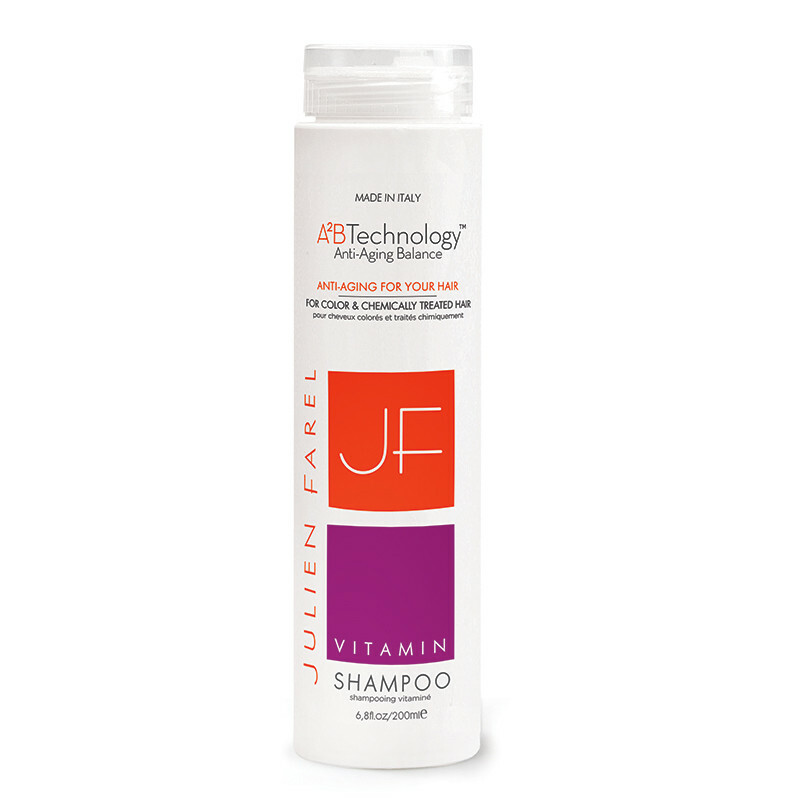 Julien Farel Vitamin Condition is a salon quality conditioner that extends your hair color by hydrating, nourishing and protecting your hair. This lightweight yet deeply moisturizing conditioner for dry and damaged hair features A2B (Anti-Aging Balance) Technology to target damage and restore hair to a healthy youthful state. Hair is unmistakably stronger, healthier and shinier. • Ideal for hair weakened by stress, over-processing, environmental damage or seasonal change. • Key Anti-Aging ingredients such as Hyaluronic Acid and Keratin add lightweight moisture for softness and manageability • Vitamins B,C,E nourish and strengthen to prevent overdrying, make hair more resilient against breakage and environmental damage • SLS and Paraben Free. Color Safe. Dermatologist Recommended. Now available in deluxe travel size! 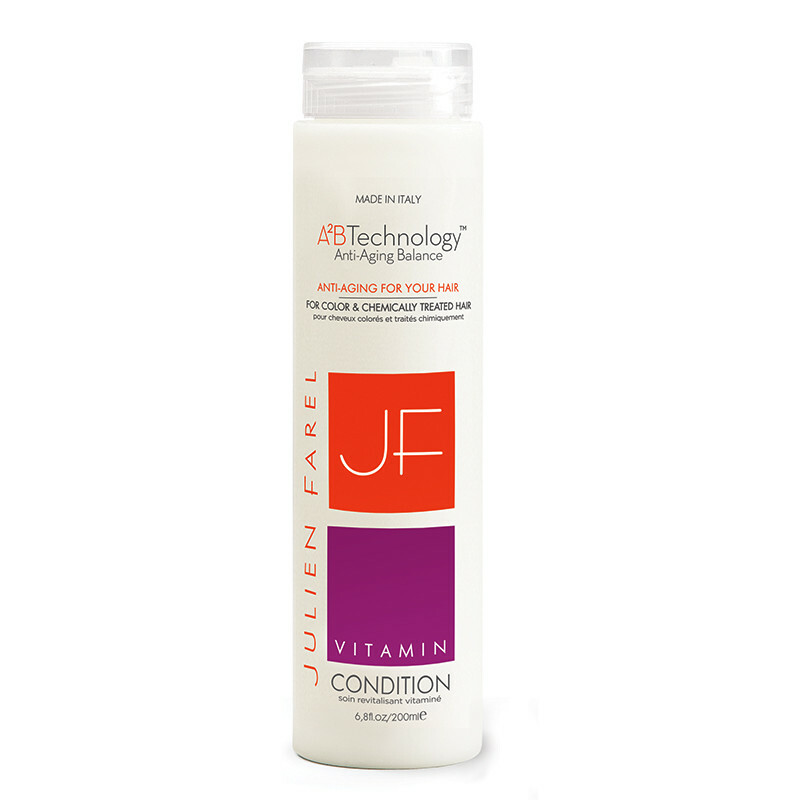 Julien Farel Vitamin Condition is a salon quality conditioner that extends your hair color by hydrating, nourishing and protecting your hair. This lightweight yet deeply moisturizing conditioner for dry and damaged hair features A2B (Anti-Aging Balance) Technology to target damage and restore hair to a healthy youthful state. Hair is unmistakably stronger, healthier and shinier. • Ideal for hair weakened by stress, over-processing, environmental damage or seasonal change. • Key Anti-Aging ingredients such as Hyaluronic Acid and Keratin add lightweight moisture for softness and manageability • Vitamins B,C,E nourish and strengthen to prevent overdrying, make hair more resilient against breakage and environmental damage • SLS and Paraben Free. Color Safe. Dermatologist Recommended. 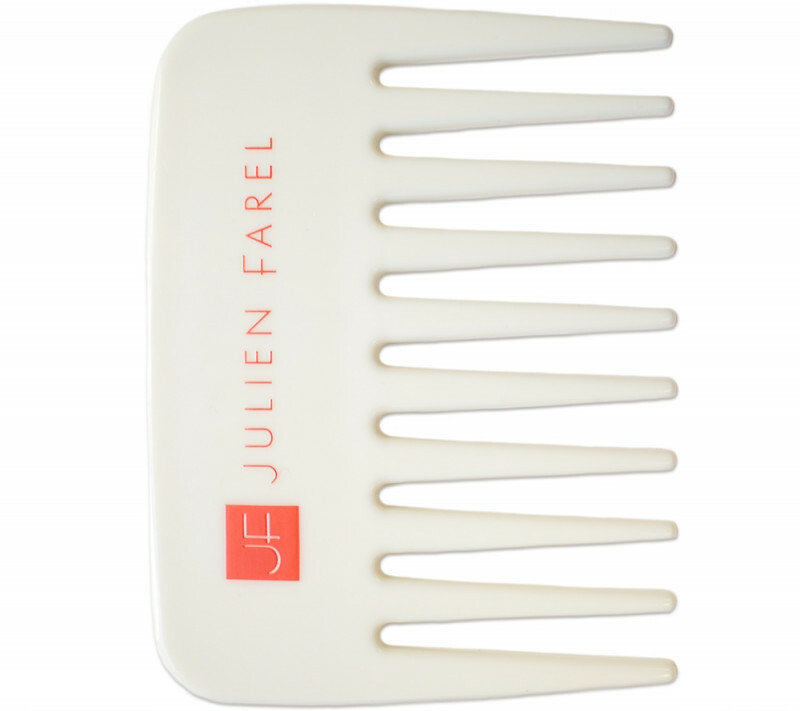 A palm-sized, round edged comb safe for detangling wet hair. Made in Italy, this travel sized comb gently glides through to smooth and detangle hair. A grooming essential for all hair types and lengths. Comb measures approximately 3-3/4" x 2-3/4.